After reading through all theses posts, and listening to my creaky stock suspension, I am ready to do the rubber equalizer and wet bolt upgrade, but have a concern with my 2011 Keystone Springdale 189. 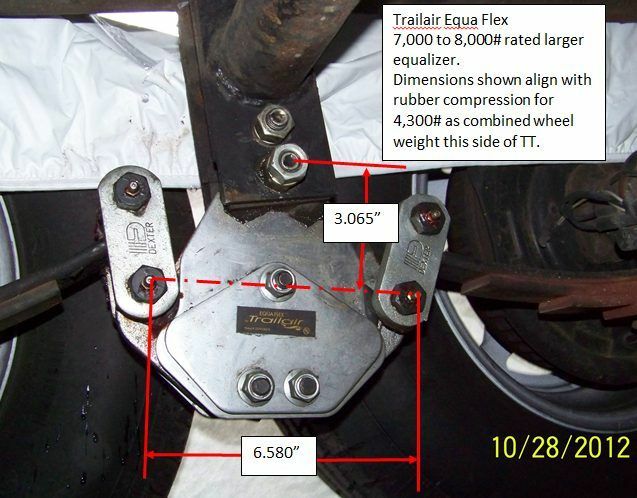 It has 3000lb Dexter axles and I am concerned about clearance when using the EZ-Flex equalizer. When I was shopping for tires, I was thinking of upsizing so I measured top of tire to wheel well and only have 2.7" with the stock size tires, not the Dexter recommended 3.0". In talks with Dexter, their only solution is the axle flip which results in too high of a trailer for my purposes. The EZ flex is supposed to maintain the stock height, but I definitely do not want any drop at all. In shopping around I found the Lippert Equa Flex that is longer and would get me to at least the 3" (3.4" by my calculations). The Equa Flex says for 4-6k axles, so I contacted Lippert and they said that the 4-6K Equa Flex is right for my trailer and axles. Has anyone noticed any drop at all using the Dexter EZ-Flex? Has anyone used the Lippert Equa Flex and noticed a change in ride height? Thanks for any help or advice on this. I too did not use the Dexter because of concerns about drop. But since then I've been told that the Mor-Ryde cushioned equalizer would work and actually raise the trailer a bit giving me more tire clearance. Haven't done it though as the wet bushings and shocks seem good enough for now. I have been through this, first with losing ride height from the original Dexter EZ flex smaller one, then a 2nd time when I went from 15" tires to 16"and may be able to help. In my case, my TT manufacture set my camper up as a lower riding camper even with a slide. I have a 10,000# GVWR and I weigh in loaded at 9,950#. With the rigid equalizer I only had 2.5" of fender clearance, not the 3" plus that other brands have. I can tell you, you really do not want to go below 2" as in the 1 7/8" area under certain conditions you can kiss the fender = not good. I was on short springs with a 32 " axle center not the more standard 33" and have the axles under the springs. Doing a flip would put be sky high, just like your situation. Then I upgraded from 15 to 16"LT tires. And had to deal again with ride height. I tried the larger Dexter which helped but I was close to binding on the springs. So I ended up going with the Trail Aire, but this takes a bit of manipulation and in my case I could do it since I had a custom equalizer hanger mount. Your situation is a good post by itself. This can get somewhat technical on how to work out of the problem. A change in equalizer brand and shackle length are options. I wonder if the Moderators want to move this topic and the replies to a new post or leave it here. It is a good topic for those of us without the standard setup. I called Mobile Outfitters too and quizzed them if the heavier one was OK with my weights and they told me at that time it was OK and I'm glad I did. The nuts that come with these kits are not serrated. Is anyone concerned that the replacements nuts will back off the threaded bolt ? Has anyone bought the serrated flange nuts aftermarket and used them instead ? Not really. I got the Mor Ryde big bolt set up which requires longer bolts. I did put some blue loctite on them If you are really concerned you could get lock nuts for them. I don't see a need for cotter pins and castellated nuts in this application. So I am running into a problem. I ordered the Equa Flex equalizers and the Never Fail bushing kit, both from Lippert, and the parts do not fit together! The equalizers showed up with thin .040" plastic (Teflon?) bushings and the Never fail kit came with .060" bushings. The thin are too thin and the thick are too thick. The supplied 9/16" step bolts are sloppy in the thin bushings and will not push thru the thicker ones once installed in the equalizers. 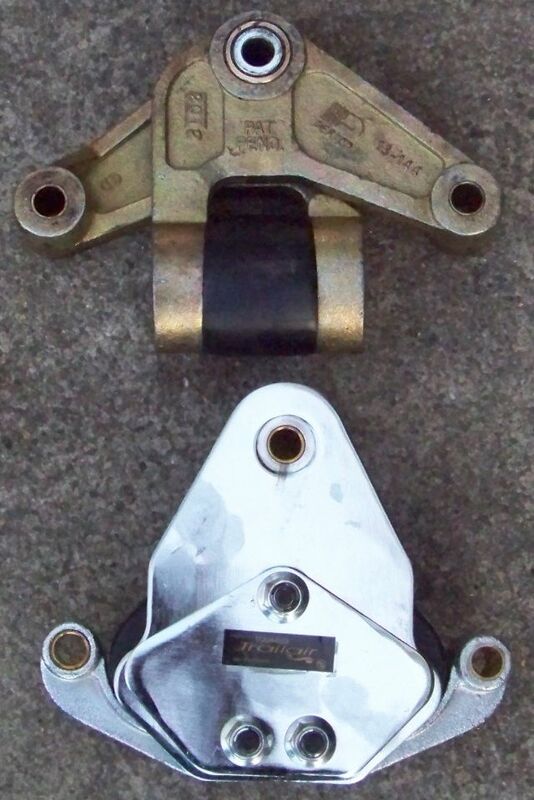 I called Lippert and they told me the top bushings should be brass, and sent me two. The brass will not even come close to pushing into the top hole of the equalizers. I gave up and took the trailer and parts to a local RV repair shop. After three days he called me up and said come get the trailer, the parts don't fit together. Lippert changed out the parts, and the new measurements are the same as the old. ??? I can't seem to figure out what bushings and bolts go into the equalizers and even worse, Lippert doesn't seem to know either. They look like nice equalizers, but they are not doing much good sitting on my bench in the garage. I am at a total loss on a solution for this one. Return the stuff back to LCI and order what you need from Mor Ryde. I don't know if this will help, but here goes. You did not state which Equ-Flex you bought. In my last post a few responses up, I suggested to use the larger EQ unit on your trailer and there was a qty of reasoning behind that. There is obviously a manufacturing goof up somehow/somewhere. If you bought the smaller EQ, they may have only put in thinner bushings and not allowing the Never Fail bushing upgrade. Did you ask if Never Fail could be used with the EQ unit you bought? 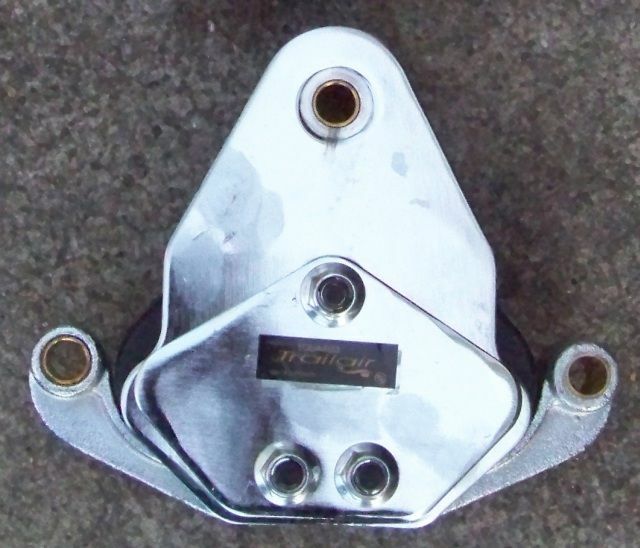 I will also add as an FYI, on mine, the larger unit, I ended up putting wet bolts with a grease fitting on the bottom center 2 pivot points of the lower arms in the EQ unit. They have been reported by others to freeze up and no longer pivot. Mine did not yet bind up but where close. Now that I can lube the pivot points, all is well. I did go with the smaller (4-6K per axle) equalizer, mostly since my trailer has a max weight of 6K. There are no brass bushings installed from the factory in either set of equalizers I received, just the thin .040" plastic ones that easily push in and out with my fingers and are loose around the 9/16" step bolts. The brass bushings that Lippert sent after I questioned them do not fit no matter how much pushing with a C-clamp; I think any more force will distort the bushing. I will look into the larger equalizer; sounds like I should have the first time. OK, I now better understand your axle sizing. My bad for not understanding your camper sizing better. If the entire camper is rated at 6,000# GVWR, then the larger EQ unit most likely will be be way too big. You will have a large shackle length issue. My comments where where based on the overlap of size ratings. LCI has a LCI spec sheet on EQ 4,000 to 6,000 rated smaller one and a 5,000 to 8,000# rated larger one. The issue I found is when you are into the cross over area. If you have 5,000# to 5,200# axle sizing, on a approx 10,000# GVWR, you could by the spec's, go with either one. In this case the larger unit is better because of the weight ratings. In your case, yes, the smaller unit fits better from a sizing stand point. I really think now seeing how small your axles are, the big unit it way too big. Odds are high you may have 3,500# axles tubes with 3,000# springs creating a 3,000# GAWR. To help you not accidentally buy a way too big EQ, see these dimensions on what the big one is. Now what can you do? It appears LCI changed something and their documentation is not easy to follow. LCI EQ page Even in this scrolling video, they show the Never-Fail bushing along side the smaller EQ unit. But as you have in your hand, they do not fit. 1. Deal with the Trail Aire nylon bushings. An option, just not a great one. It would be good to know what they do not put the Never Fail as an option to install in these. Or even an upgrade to a reasonable bronze. Only having the nylon if that is what they did, would be a kill shot for me. The nylon just does not hold up long term. 2. What will not work right with the smaller Dexter unit? You can buy different length shackles. Dexter has very good aftermarket support that "helps". Give their 1 -800 tech service a call. 3. Mor-Ryde now makes these rubber equalizers too. You will have to sort out the correct shackle length for these too. I have seen these and helped rebuild one before, they are well made. Hope this helps you sort out your situation. Let us know how you end up. I had a special axle spacing other then the standard and had to go through all this, just the larger system. Seems you have the same issue just on the smaller system.